Are you ready to take the #LEAPPP? LEAPPP stands for Law Enforcement Academy & Physical Preparedness Program. This program is 8-weeks, 5-days-a-week and incorporates short and medium distance running, strength, work capacity, core work, and calisthenics. LEAPPP is for specifically for aspiring Law Enforcement Officers or those currently going through the hiring process for a department. However - current LEO's and non-LEO's are more than welcome to complete the program. How will LEAPPP be used? 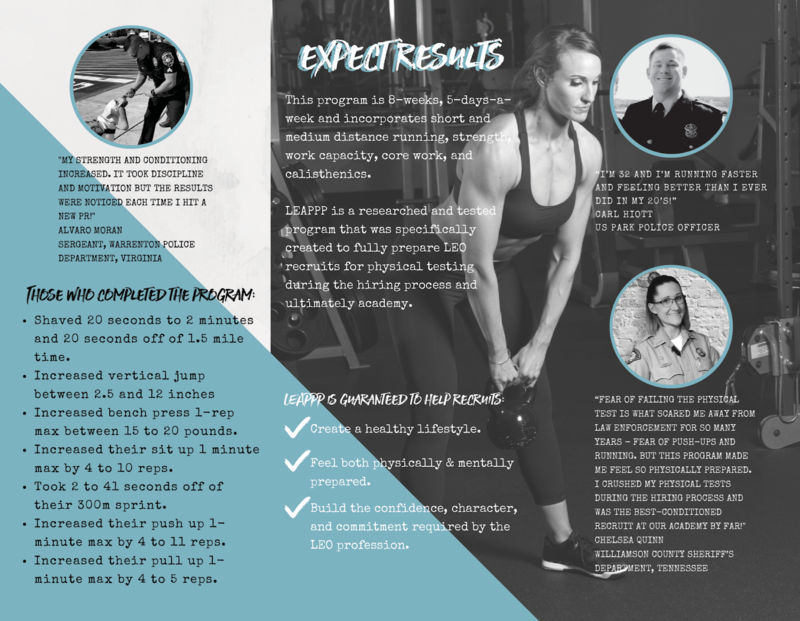 After training many aspiring LEO's in person for their physical preparedness tests and/or Academy (during the hiring process) - I first created this program with the intention for it to be delivered online to aspiring LEO's in order to be able to help more go into this profession prepared. Currently I am meeting with academies and agencies all over the country about using LEAPPP prepare recruits and cadets for the physical demands of academy and the job prior to beginning. 1) Getting in shape prior to academy will decrease injuries during academy. 2) Getting in shape prior to academy will allow more of a focus to be placed on classroom learning and skills necessary for the job. 3) Creating a fitness habit BEFORE academy increases the chances of continuing with the habit after graduating from academy, which as I've learned, is the most crucial time for creating a career-long fitness habit (therefore decreasing the instances of heart attacks or injuries on the job). 4) Increasing the fitness levels of recruit candidates. At such a sensitive time for this profession, I've heard from multiple agencies that the number of applicants is down and classes are smaller. Fitness standards already suffer at the local level due to the lack of testing - and the smaller pools of recruits can only exacerbate the problem. How will I know I've improved? LEAPPP uses the Cooper Fitness Test as a standard and participants are tested for progress on week 1, 4, and 7. LEAPPP is delivered through an app called TrainHeroic which is accessible by mobile device or computer as well as a PDF Program Download. I chose the TrainHeroic application after carefully researching (and using) several others on the market because it is by far provides the best user experience when it comes to coach to athlete communication, program design and delivery, and athlete tracking. Below is a screenshot of a training day block. Each day is broken up by different blocks such as Warm Up, Strength Block, Work Capacity Block, etc. Athletes going through LEAPPP at the same time will be placed on a team are able to track their reps, weight, and times easily and leaderboards have been created to be able to compete with other team members. 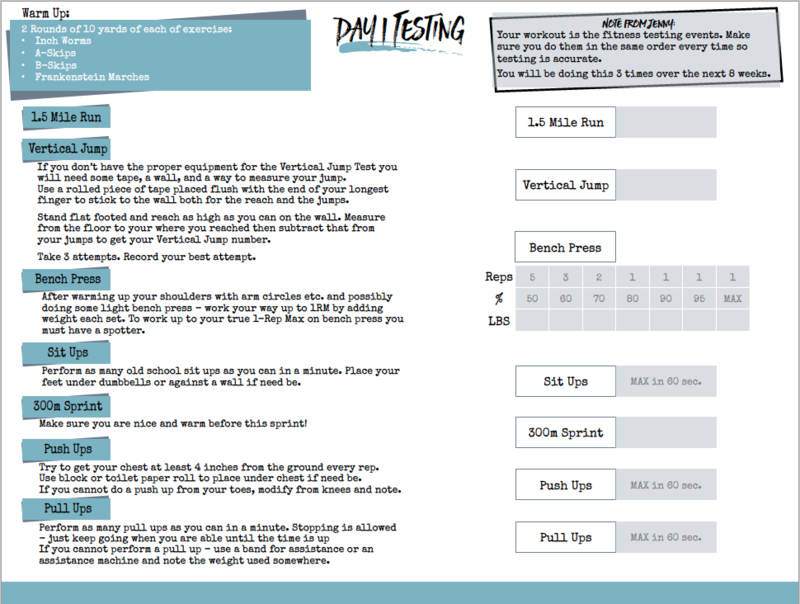 You are able to access TrainHeroic via desktop computer (at www.TrainHeroic.com) or will be provided a special link to download and print out the entire workout if you prefer a paper copy. 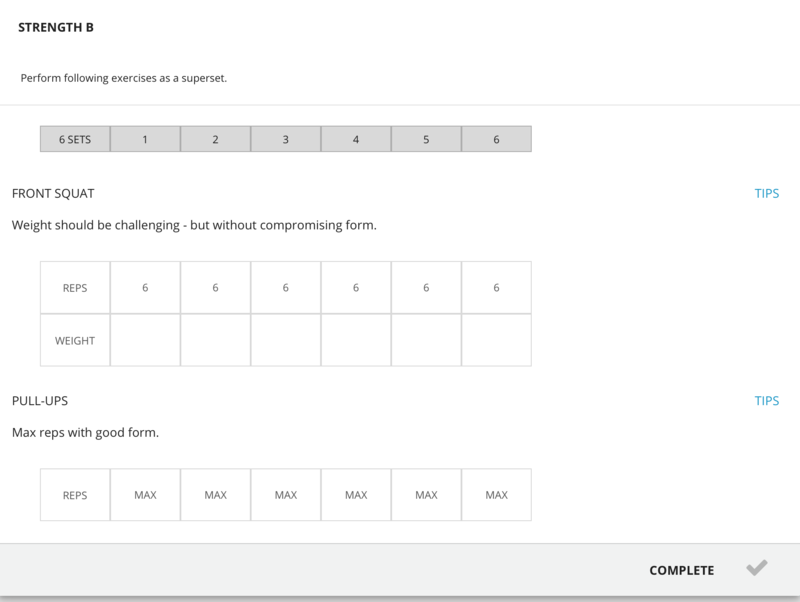 As you are learning your way around the format and the application, the workouts can take up to 1.5 hours. However, as you get used to the exercises (and see them again) and the format, the workouts will shorten in length. Most who are currently in the program average 1 hour to 1 hour 15 minutes from 3 to 4 days a week. This does vary from day-to-day though, because one day a week your workout will consist of a "longer" run (anywhere from 2 mile to 4 miles) and another day has a slightly shorter format as well. At the end of the day, it depends on how fast you are moving through the exercises. The goal is to be able to move faster with shorter breaks by the end of the program which means you've increased your work capacity. This is a very dense program and you may not be able to complete entire workouts at the beginning, however the goal is consistency over perfection. Meaning, do the best you can each day to get through what you can with the time you have available. As mentioned above, this will improve over time. Do I get access to a coach during the program? Yes! I (Jenny DeMarco) will be there every step of the way. I'll be able to see all everything you track on the TrainHeroic application - plus you get access to a supportive Facebook community with your entire team and graduates of LEAPPP. I am very active in this group and will be in there answering questions and helping on a daily basis. If you do not have a Facebook account, you are more than welcome to email me with questions throughout the duration of the program! Do I need gym access and/or equipment? A gym membership is recommended unless you have at least a barbell, bench, dumbbells, and a pull up bar at home. I've also made a list of suggested equipment (with links). Ignore the nutritionals at the bottom unless you are interested. This is a list of equipment you will see in the program at some point. However, it is NOT necessary to purchase the equipment in order to complete the program (unless you cannot do pull ups - then I do recommend getting a band or two for assistance). And in full disclosure: the ONLY affiliate link is timer GymBoss Timer. The rest are just simply things I use and believe in. Again, these are not necessary to complete the program and can easily be substituted.